Granola bars are such a great breakfast or snack. 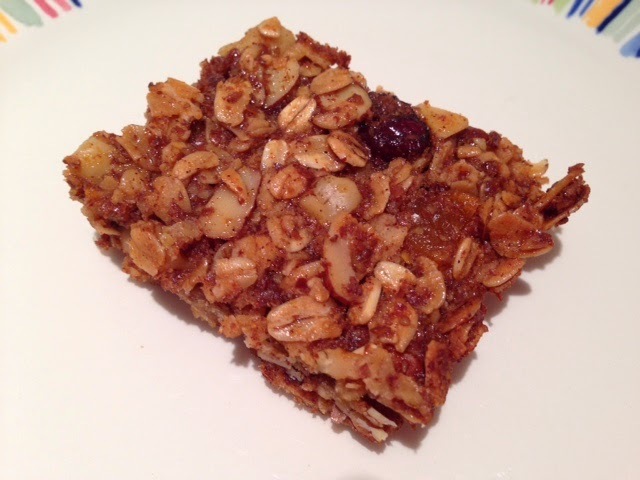 I usually snack on almonds throughout the day but this week I decided granola bars would be a nice change for me so I made Giada's Chewy Granola Bars from her cookbook "Giada's Feel Good Food". I actually followed the recipe and only made minor changes to it, and the granola bars turned out perfect! 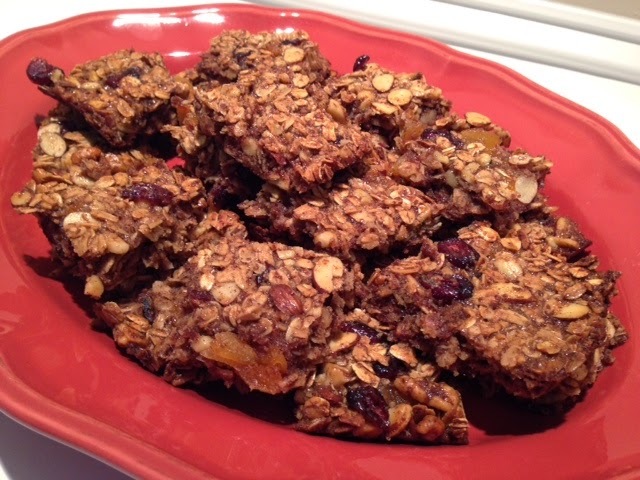 The recipe called for 1/3 cup of raisins, 1/3 cup of dried cranberries and 6 dried apricots. I'm not a huge fan of raisins so I added extra dried cranberries and I doubled the amount of dried apricots because I love apricots. The recipe also calls for chopped almonds but I used sliced almonds instead. Preheat oven to 350 degrees. Spray a 9 x 13 inch baking dish with cooking spray. Then place tin foil or parchment paper into the baking dish and spray the tin foil or parchment paper with cooking spray. In a large bowl, whisk the honey, grapeseed oil, egg whites and vanilla extract until blended. In a separate bowl, whisk the oats, flaxseed meal, cinnamon, nutmeg and salt together. Then pour into the honey mixture. Stir until combined. Then add the almonds, walnuts, dried apricots and cranberries into the mixture and stir until combined. Pour the mixture into your baking dish and spread the mixture with a spatula. Cool for about 30 minutes before removing the tin foil or parchment paper from the baking dish. Then cut into squares. This makes about 15 - 20 granola bars.